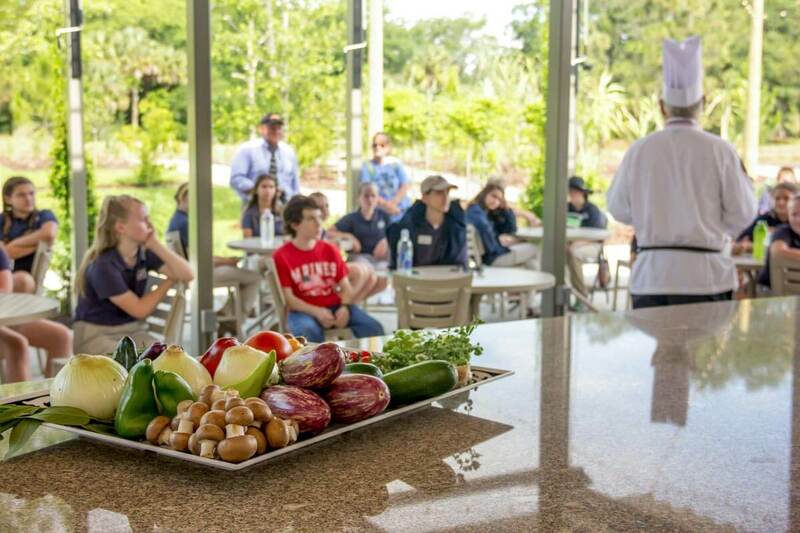 The Outdoor Kitchen and Kitchen Garden offers opportunities for programs centered on plants as sources of food, health and wellness. Students can learn about the food they eat, where it comes from and how to cook it as well as participate in engaging culinary lessons. What is the difference between an herb and a spice? Students will learn the answer as they explore our herb garden through touch and smell, and create their own herb and spice seasoning blends to try on freshly made air-popped popcorn in our Outdoor Kitchen. They will enjoy making a fragrant art project out of dried herbs and spices to take home, and will take a walk to the Singing Tower to feed the koi. parts and our food. They will whip up some healthy no-bake energy bites using different plant part ingredients to enjoy in our Outdoor Kitchen, and take a walk to the Singing Tower to feed the koi. Relax in the Gardens with a mindful walk to the Singing Tower to feed the koi, come together as a group with a team building activity, and create smoothies during this program. Your students will practice paying attention to the present moment with all of their senses to focus on their experiences during their mindful walk through the Gardens. They will work together to make unique smoothies in the Outdoor Kitchen using a variety of ingredients to create fun flavor combinations, and then they will sample each other’s creations. Join us in the Outdoor Kitchen to make your very own pizzas! Students will learn how to make pizza dough and tomato sauce from scratch, and basic knife skills to prepare their choice of toppings. Create your unique pizzas, and slide them into our wood-burning pizza oven for just a few minutes to cook. Students also get to explore our Edible Garden to better understand the connection between plants and our food. Optional additional charge of $10 per adult for pizza. They had a blast and I know they had a big boost of confidence as they got to display leadership skills. I was so proud of their work today. I thought the event was fantastic and I look forward to helping with future events.